Shahrad Review 2019: Is Shahrad a Good Hosting? Established over 11 years ago, Shahrad is a web hosting company based in Iran. The vendor offers a wide range of hosting solutions including VPS, dedicated servers, and reseller hosting. Shahrad is a web hosting company based in Iran. The company was started over 11 years ago and offers a variety of web hosting services that include VPS, dedicated servers, and reseller hosting. 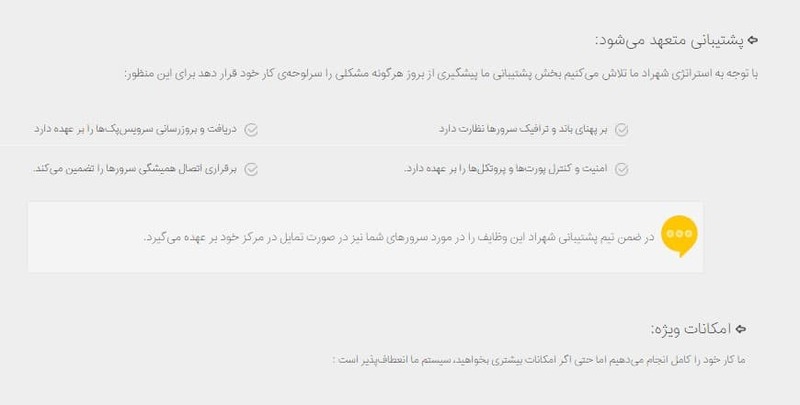 Shahrad is among the top 10 web hosting companies in Iran by market share, and the website is only available in Persian. Shahrad is not your typical web hosting company; instead of the usual web hosting features like domains, subdomains, control panels, etc., the vendor provides hosting infrastructure and resources to business enterprises. The VPS solutions are divided into seven different packages numbered from VPS10 to VPS16, with the latter being the most advanced package. Shahrad provides server rack space in five different packages based on the number of units a user needs. The lowest number of units you can take up is three. This server renting package comes with 300GB of monthly traffic, one IP, one power port, one cross connection, and one ampere. Shahrad hosting solutions are reasonably priced. However, the number of extra hosting features you might need to have a feature-rich experience can push the costs up significantly. For instance, users who want a dedicated firefall have to pay extra to get it. What’s more, dedicated bandwidth (Internet and Intranet) is provided at a fee. That said, while the vendor does not include operating systems in any of the hosting plans, it does not charge its customers to install the OS on their servers. 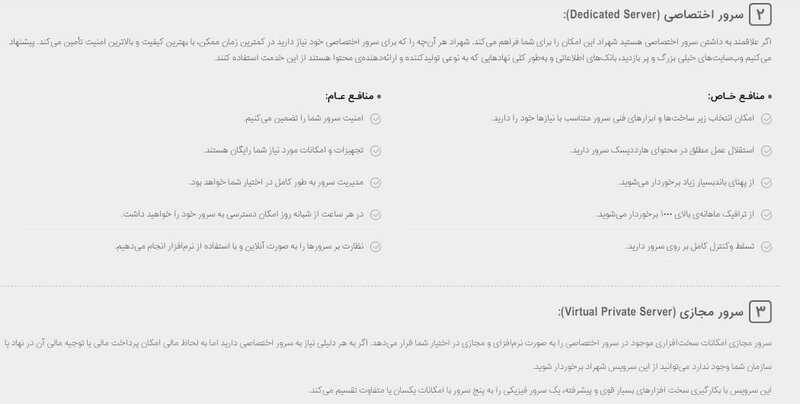 The prices of Shahrad’s hosting plans are listed in Iranian rials. Unlike other vendors who shut down client websites if they exceed the allocated resources, Shahrad accrues the extra resource use and charges the corresponding amount to the client’s account. All of its rack space plans have a setup fee. This hosting company does not have a money-back guarantee or any other refund policy. Shahrad does not offer any support phone number, email address, live chat, or ticketing system. The only way to contact the vendor is through the contact form on its website. That said, the vendor also claims to have a support team available 24/7. I made several attempts to contact their support team but was, unfortunately, unsuccessful.The Shahrad website does not have a knowledge base, but there is an FAQ section that addresses some of the issues that customers often face when using their hosting services. Shahrad’s primary customer base is large business enterprises in Iran and beyond. The decision to not make available easy communication channels does not seem to have impacted its growth as a hosting provider in Iran. The vendor’s 0.67% market share, even with an almost non-existent support system, suggests that its hosting solutions are better than they seem. That said, the vendor does not have any hosting solutions for individuals or small and medium-sized businesses. Wondering how Shahrad stacks up against other Web Hosting companies? Enter any other Web Hosting company and we will give you a side-by-side comparison.